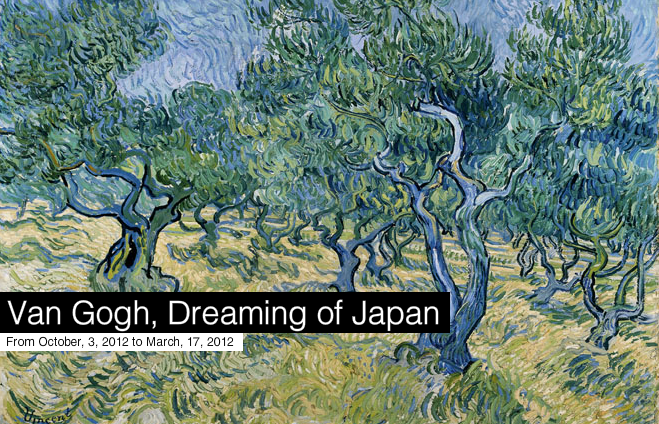 The two exhibitions displayed simultaneously in both spaces of the Pinacothèque de Paris allow visitors to compare Van Gogh’s œuvre with that of Hiroshige. Everything has been said on Van Gogh’s psychological frailty, on his bipolar disorders, his schizophrenia and on his crises of delirium accompanied by delusions, as well as on their direct consequences on his body of work and on his way of seeing the world. But it is quite legitimate to wonder if the analysis of his serious trouble, placed alongside his works’ analysis has not finally led to our forgetting the essential. A more traditional approach of his work allows us to note above all that his references were turned toward an art that was the opposite of what he produced: that of Hiroshige. An art whose whole philosophy rests upon solidity, composition, serenity, travel and inner peace. That meeting of opposites is astonishing but made possible today thanks to the simultaneous exhibition of Van Gogh’s art and that of Hiroshige in the Pinacothèque de Paris. There has never been such an in-depth study of Van Gogh’s references and never has there been such a daring confrontation. It enables us to realize that Van Gogh’s references to Japan in general and to Hiroshige in particular were not only reduced to a few key works, obvious copies of the master of Edo (Tokyo’s ancient name until 1868), but that the majority of his landscapes from 1887 onwards were constructed around a referential system, in the centre of which is found, almost systematically, Hiroshige’s oeuvre. By showing about forty works and mainly landscapes, the exhibition – the first one devoted exclusively to the Dutch artist for decades in Paris – is a clear demonstration of the importance of Japanese art in Impressionist art. The comparison with Hiroshige, thanks to these two simultaneous exhibitions is obviously a première that allows a confrontation of an incomparable accuracy.